Subject: How Much Is Alibaba Really Worth? With all the talk of Alibaba being the biggest IPO ever, the next question to answer is: How much is Alibaba really worth? When Alibaba announced its initial stock price range, the company said it would reach a valuation of $155 billion at the midpoint of that range. Now that Alibaba has lifted the range, it will likely be valued much higher. A survey of Bloomberg analysts concluded that Alibaba could be worth roughly $200 billion following the IPO. A key factor in how much Alibaba is worth is the Chinese e-commerce market. Last year, online shopping in China was a $298 billion business. That easily surpassed the United States' $263 billion, making China the largest e-commerce market in the world. 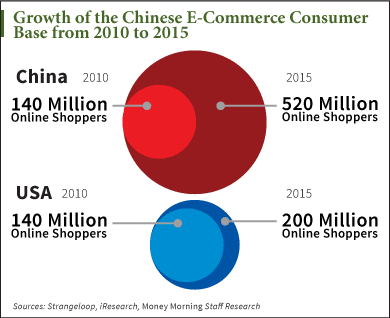 "Alibaba is the dominant e-commerce player in a marketplace – China – that's seeing incredible growth in online commerce," Money Morning's Executive Editor Bill Patalon said. "According to the research I've seen, e-commerce in China is projected to hit $540 billion by 2015, and that's just for starters. By 2020, China's e-commerce market will be worth more than the United States, the United Kingdom, Japan, Germany, and France combined. So we know that growth is coming… and we know that Alibaba is the No. 1 gun." In 2013, nearly 80% of all online transactions in China take place over Alibaba's network of sites. In 2013, Alibaba reported that its mobile sales soared 100% to 351 million units. That accounted for one-third of all global sales.